Reports from London will be heading your way shortly, as soon as I find the right cable to connect phone to PC! In the meantime I've not been slacking........having taken delivery of my Jamie's America book it was time to try out the BBQ beef ribs. Simply get a huge hunk of meat from your friendly butcher. I used beef short ribs (they are dirt cheap yippee), covered them in a mix of chilli powder/mustard/black pepper/oil/salt then cooked them at 140degrees for about 4 hours. They should fall apart pretty easily after that. Then mix your marinade, into saucepan goes honey/brown sugar/butter/beef stock cube/a splash of water, heat that lot up then pour over the meat. Give it a good massage while you're at it! Jamie's recipe says to return it to the oven for 45min, but I just gave it a short 15 mins. JO also said to cook it uncovered the whole time, but I think you'd get a better result if you covered your roasting tray in tinfoil. We had it with coleslaw and jacket potatoes. Nice! So we're back from London, I'm sad because we had such a great time and really treated ourselves to loads of gorgeous meals. Now it's back to the grindstone! In her Bread Making class last week Liz recommended Andrew Whitely's 'Bread Matters' as essential reading so I got a copy from the library last week. The combination of better knowledge of what exactly goes into a commercial loaf plus Liz's tuition making it look so easy has made me more motivated to make bread for home. Luckily for me Stokesy Jnr and Snr got rained off at work so I had an assistant in the shape of Stokesy Snr. First we made a 500g batch of 1:1 white:wholemeal using the Bertinet method. Then we had a go at lamajun, a lebanese flatbread I had seen in the Ballymaloe cookbook awhile ago and had been lingering on my must-do list. I'm sure you all have a must-cook list on your kitchen wall?? Oh just me then. Once I've got my new magazines/books in I run through all the cookery literature I own and pick out loads of new things to make over the month. What a thrilling life I lead! The flat bread was simple: 275g white flour, 225g natural yoghurt mixed together to form a soft dough. I added a little extra water as ours was too dry. Portion into 50g chunks, then roll each chunk out til about 10cm across, you'll need plenty of flour on your worktop. Then dry fry your flatbreads on both sides in a preheated frying pan. Once then are golden on each side you add this lovely topping: 1tsp thyme leaves, 2 tbsp toasted sesame seeds, 1/2tsp sea salt, 2 tbsp olive oil. Mix the topping in a little bowl then use a pastry brush to brush over each flatbread. We dunked ours in hoummous but all agreed that it would be nice Italian style with garlic butter and tomato sauce. YUM! This was meant to be Sunday brunch at Lantana, but when we got there it was shut...boohooo. So we headed over to Marylebone High Street and The Tapa Room which I had seen recommended on the Time Out website. We had to queue for 25 mins just to get a seat. My brother having the perfect timing, arriving as we sat down! Hmmmm.....but would it be worth the wait? Apologies for the single (and quite frankly rubbish) picture. We were starving and I totally forgot, by which time we had all shared out our dishes. You can even see my brother's fork diving in for more....get back! A quick look at the menu indicated that this would be a very very very good brunch. Loads of Aussie-style dishes, man those Aussies can dish out a killer brunch! Since my return I have learnt that the head honcho there is a guy called Peter Gordon (he's Kiwi...sorry!) and he had an article in the December 09 issue of delicious magazine. So there you go. Accompanied by cake, smoothies, hot chocolate and a very strong Bloody Mary.....YUM! After stuffing ourselves at lunchtime it was time for something a bit lighter Saturday night. Meeting up with my brother and his friend at a little Iranian joint on Warwick Rd, which was handily only 1/2 mile from where we were staying. However......I totally messed up the directions. leading to an unexpected. 45 minute pre-dinner stroll. Stokesy HATES walking so I was in the bad books by the time we got there. Errm not quite No. 10 Downing Street but a really good Schezuan restaurant called No. 10, down an alley opposite Earls Court tube station. Stokesy and I came straight from the airport to meet Kerry, Brett and my brother, Andrew. The food was soooo good. We had a load of stuff to share including.....Dim sum - Prawn Ha Kow and Pork Siu Mai.....Steamed sea bass with chrysanthemum.....Green beans with crispy pork (above)......Aubergine something nice (top pic)....Chives with egg.......Crispy duck with veg. It should be noted that all of this came with copious amounts of chilli.....oh and it was a really good value meal. All that food, plus a couple of other dishes and a few beers came to £100 for 5 including service. Bargain! Yes me and stokesy and heading to the capital........no not Douglas.......London! Wahooo! These include lunch at Moro......I love love love their recipe book......I'm so excited about going....have checked out their menu online. Ooh go on....have a look. I reckon I'll have Grilled aubergine and yoghurt salad with crispy lamb and chilli butter.......followed by.....Wood roasted pork with patatas pobres and churrasco sauce....YUM! 2010 timetable and catering menus...wahoooooo! Next 'momentous' bit of news is that the Autumn/Winter catering menus are now available. Like the sound of Garlic Butter Popcorn? Fennel Crusted Pork Belly? Apple and Champagne Icecream? Just a few of the delicious new dishes on the menu. Relish specialises is catering for Weddings - Private Parties - Corporate Events. So give us a call and we'll provide delicious food for your event, large or small. A new class at the cookery school......yippee! Sunday was Bread Making Day with Liz from artisan bakery The Good Loaf. Our participants were: Angela and sister Jan, Marie and son Robbie, plus Andrea and Michelle. The day began with two different methods for making a basic white loaf 1. The traditional British knead and fold 2. The noisy French twist and slap! Next up: a simple 'no knead' foccacia topped with tomatoes and basil. Perfect for a party buffet! After coffee break we discussed the essential bits of kit while making scones. Robbie has a dairy allergy so substituted the butter/milk and still got a great result. Oooh ooh ooh that's me! Supervising some big Hairy Biker bloke dealing with some squid. Can I give my excuses for the non-posting now??? Well I was super-busy doing the 1st Isle of Man Food & Drink Festival. 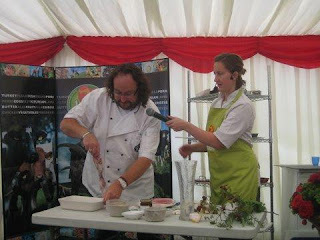 I was hosting the Food Live Theatre which saw demos from The Hairy Bikers, the I Love Manxchef finals, plus loads of demos including Tim Croft, Tanraogan, ISle of Man College, Butlers Choice plus booze from Okells, Bushys and The Shore. The event was a massive success, I think they got 8000 people through the door. The demos were certainly packed out......so hopefully the event will run again next year...wahooo! I haven't previously been too keen on sugar work after burning several pans, welding spoons to the worktop and covering the floor with caramel strands. But we conquer our fears and work through our weaknesses etc etc oh and caramel tastes good too so there's some motivation. In at number 3........oh baby it's....Nasty Girl - Notorious B.I.G. Last night in France meant it was time for us to get creative, think up (squabble over!) our own 2 course menu then cook it over the day for service in the evening. I think we did pretty well, worked in perfect synchrony as a team..hahaha not too much squabbling anyway. The pork was absolutely gorgeous, melt-in-the-mouth, we did it in the sous-vide at 80degrees for 18hrs. I've since done it for a cookery school using the following method. I overheard 1 woman say it was the best pork she has ever tasted..wahooo! Method: Pork belly in roasting tin on top of 3 stalks of celery, water up to just below fat/skin line. Cover with greaseproof, then tin foil. Into oven at 170 for 1 hour, then 140 for 1 hr, then 120 for 3 hours, then I had to go to bed so I jut switched the oven off and left it in.In the morning I just took it out, removed the skin and did the crackling thing with it, then removed the bones from the belly before reheating it. It was super-tender and v delicious....oh and I did loads of SALT and fennel seeds on the skin.yum! Sorry the France posting is 1. late 2. all out of sync......I'll get more pics up over the next couple of weeks........i promise miss!